If you have followed my blog for a bit, you may know that there is one thing I am very consistent about in the summertime. So that we do not get stuck in any grilling ruts, I try and change things up a bit. I play with marinades. I tinker with new meat cuts. And I ask my husband to put things on the grill that make him shake his head in bewilderment at me. Watermelon? He asks. Peaches? He questions. But I know that he likes it. He loves when guests are over and claim such grilled meals to be delectable delights. After all, unlike the winter months, he gets to claim just a bit of that glory all for himself. He is, of course, a self-proclaimed King of the Grill around here in the summer. And even if I did prep, marinade, coddle, rub, and love that food before it ever entered his hands, he was the one who laid it on those hot grates. For that, I suppose I can let him take some of the credit. I am just generous like that. One more thing. I am going to admit it here. He is a darn good griller. He has an uncanny knack for pulling that meat off at precisely the right moment. Every single time. It is a skill that was completely inherited from his mother. She is the Queen of her outdoor cooking domain in her home. She has passed down her talents to her son. And I am ever so grateful…considering I am inherently barbeque-challenged. 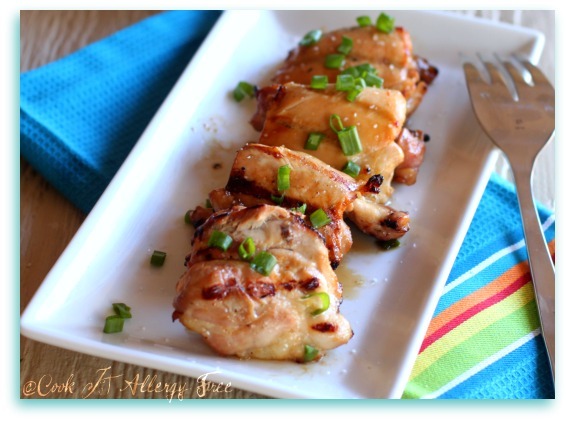 This Grilled Chicken Recipe is one that makes it onto those grates often around here. It is so simple to throw together and has such a refreshing summer flavor. It pairs perfectly with my Gluten Free Grilled Asparagus with Balsamic Tomatoes or with my Grilled Veggie Packages (recipe to come). And I love that I can throw the marinade together early, let it sit through the day, prep some vegetables beforehand, and then just hand it all off to my hubby at dinnertime, and viola. Dinner. Done. 1. In medium bowl, create marinade. Whisk together: Orange Juice, Soy Sauce (or Soy-Free option), Honey, Ginger, Garlic, Sea Salt, Chili Paste, and Scallions. 2. Place Chicken in a glass bowl or baking dish that just fits chicken pieces. Pour Marinade over chicken so all pieces are covered in marinade. Marinade at least 1 hour and up to 8 hours. 3. Preheat Grill. Remove Chicken from Marinade. Season chicken on both sides generously with Sea Salt and Cracked Pepper. Grill Chicken over medium-high heat for about 9 – 10 minutes per side. What is the most unique thing you have thrown on the grill? My boys would be in heaven with this meal! I will definitely try this one out for them soon! Thank you for this recipe & link to a soy free, gluten-free, vegan substitute for soy sauce! The only sub I’ve found is a recipe that only last a few days and that is not possible to keep on hand for recipes. checking now to make sure it is also free of mustard seed so we can try it as a family! This looks like a good variation to a similar recipe I use on my blog called “Vietnamese Grilled Chicken”, will defintely be trying this! Most unique thing I have grilled Either homemade pizza crusts or a tortilla sandwich brushed with peanut butter, sprinkled with chocolate chips and marshmallows, topped w/ sliced banana and grilled until all melted and gooey!! At work we have to pass competencies on the industrial cooking equipment from time to time for OH&S, one thing I admitted I couldn’t do is light the heavy grill (I can cook on it !). When the boys teased me saying “you’re a chef, can’t you manage a BBQ?” I replied ” No, but I can manage a husband, he does all the grilling at home.” The boss laughed and signed me off anyway! You two make a good culinary team! Very cute post and delicious looking meal! We don’t have a gluten-free grill around here…actually we don’t have one at all as it got left outside and rusted…but I do have a boyfriend who’s now eating gluten-free for me, so maybe someday I’ll have a grill too? 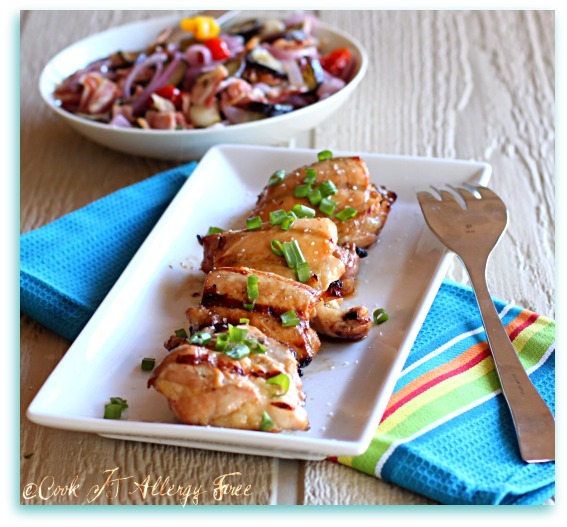 I am always looking for something new to do with chicken on the grill as we eat a whole lot of it. This is a great flavor combination that I will be trying really soon. Thanks so much! I hope you have a fantastic weekend!